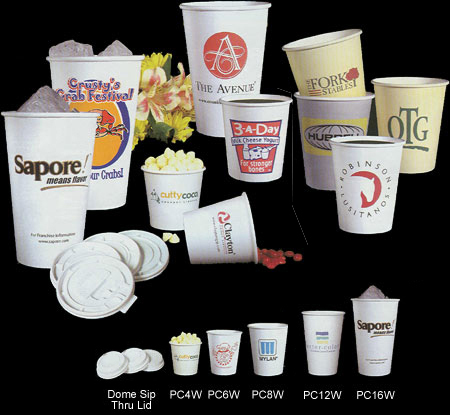 Our Custom-Imprinted Paper Cups are perfect for serving both hot and cold beverages or foods. Made of thick paper-board, these Paper Cups are coated on the inside to ensure sturdiness during use. Lids are available for 6 through 16-ounce (pint) sizes. Choose from either one- or two-sided imprints. Normal production time is just five working days for all Paper Cups. Rush production/delivery is available for an additional charge. Please note that these Paper Cups are not recommended for alcoholic beverages. We also offer Custom Printed Coffee Cup Sleeves to fit these Paper Cups. No extra charge for same color second side imprint, but you must request it at time of order. To order or for additional information on these Paper Cups, please call 1-800-233-0828. Feel free to browse our wide selection of Custom-Imprinted Glass Glassware, Custom-Imprinted Plastic Glasses, and Custom-Imprinted Foam Cups.